PLASTIC "P" CLIPS. Buy quality Auto and Marine Electric Parts and Accessories online, Sydney. 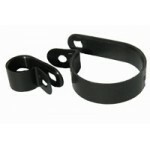 CC03BBlack Nylon Cable Clamp "P" Clip 3.2mm diameter, (1/8") clamp Mounting hole is 4.6mm diam..
CC05BBlack Nylon Cable Clamp "P" Clip 4.8mm diameter, (3/16") clamp Mounting hole is 4.6mm dia..
CC06BBlack Nylon Cable Clamp "P" Clip 6.35mm diameter, (1/4") clamp Mounting hole is 4.6mm dia..
CC08BBlack Nylon Cable Clamp "P" Clip 7.9mm diameter, (5/16") clamp Mounting hole is 4.6mm dia..
CC10BBlack Nylon Cable Clamp "P" Clip 9.5mm diameter, (3/8") clamp Mounting hole is 4.6mm diam..
CC13BBlack Nylon Cable Clamp "P" Clip 12.7mm diameter, (1/2") clamp Mounting hole is 4.6mm dia..
CC16BBlack Nylon Cable Clamp "P" Clip 15.8mm diameter, (5/8") clamp Mounting hole is 4.6mm dia..
CC19BBlack Nylon Cable Clamp "P" Clip 19.4mm diameter, (3/4") clamp Mounting hole is 4.6mm dia..
CC25BBlack Nylon Cable Clamp "P" Clip 25.4mm diameter, (1") clamp Mounting hole is 4.6mm diame..
CC28BBlack Nylon Cable Clamp "P" Clip 27.5mm diameter, (1 1/16") clamp Mounting hole is 4.6mm ..
CC32BBlack Nylon Cable Clamp "P" Clip 31.8mm diameter, (1 1/4") clamp Mounting hole is 4.6mm d..
CC38BBlack Nylon Cable Clamp "P" Clip 36.7mm diameter, (1 1/2") clamp Mounting hole is 4.6mm d..